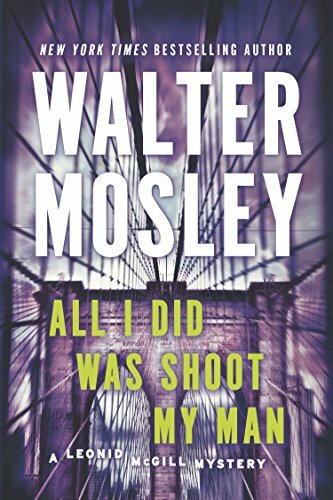 Walter Mosley’s dialogue is richly presented in an urban patois that rings as true as his New York City settings, starting right away with the Port Authority Bus Terminal in All I Did Was Shoot My Man, a Leonid McGill mystery. The character for whom this series is named is a complex man made complicated by events, not the least of which is the appearance of McGill’s long-thought-dead father in a pivotal, yet strangely silent, ghost-like turn. The book’s title derives from the admission of Zella Grisham that she shot her man, Harry Tangelo, when she found him in bed with her best friend. Her time in prison was based not so much on that fact but rather on the finding of cash in her storage space from a massive, multimillion-dollar robbery. This is apparently a frame-up and McGill spends the next 300-plus pages trying to make sense of a convoluted mystery peopled with Mr. Mosley’s vivid characters. “Near two in the morning I put a slightly tipsy Zella Grisham into a yellow cab, paid her fare up front, and even kissed her on the cheek. The way she leaned into that kiss I could have probably climbed in with her. But I try my best to maintain decorum with my clients.” This little passage early in the novel helps to establish a level of integrity that lies deep within our hero’s constitution. His is very much a conditional morality. There’s no need to tell an abbreviation of Walter Mosley’s story here. If the reader wants a complicated and well-told mystery, it’s here. Add in a hard-boiled, dark, noir atmosphere that’s oddly reminiscent of the great novels of James M. Cain such as The Postman Always Rings Twice and Mildred Pierce, then that’s a worthy bonus. Jonathan Rickard has a long history as a creative director and partner at an ad agency, a museum curator specializing in ceramics and pottery, and has published articles on the decorative arts. Diagnosed with MS in 1999, he quit advertising to complete a book on pottery as well as a memoir, completed while a member of a prestigious writer’s workshop at Wesleyan University.